Solar power developers have offered to sell electricity in India at less than Rs 5/unit. 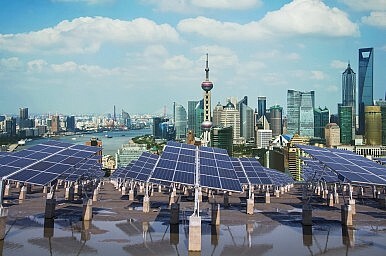 This makes solar competitive with traditional forms of energy, and makes new nuclear power plants financially unviable. India must register the changed reality, and discard the idea of expensive Western reactors. Time to scrap the India-U.S. nuclear deal? Hard on the heels of falling oil prices and affordable shale, comes another dramatic energy changes for the energy industry: The falling cost of solar energy. This has many implications, but the most immediate impact the nuclear power industry, large parts of which may have just become obsolete. This means that the new nuclear power plants being planned by India, especially those with foreign collaboration, must be reconsidered and scrapped if they are financially unviable. Most significant is the impact on the India-U.S. nuclear deal, held up by the liability clause to enable these reactors, and a sticking point in the bilateral for several years: technological advances have addressed an issue that negotiators couldn’t resolve. MAZAR-E SHARIF, Afghanistan — The coalition soldiers arrived on a dusty ridge line east of this city near dusk, as a cool breeze swept in from the hazy desert plain that stretched for miles below. Fighting positions likely dug decades ago by the Russian military sat at the edge of the ridge, and were marked with numerous stones painted bright blue on one side. The fighting positions and their winding trenches appear on several ridges nearby, the soldiers said during the Oct. 27 patrol. But the holes hint at something else: The complex history and evolving security threats in northern Afghanistan, where the challenges are in some ways similar to other parts of the country but in other ways significantly different. Northern Afghanistan includes nine provinces stretching from Faryab along the Iranian border to the west to the soaring cliffs and gemstone mines in Badakhshan to the east. Long known as one of the country’s safest places, the region has more recently seen the temporary fall of Kunduz, a major strategic city, to the Taliban and other violent groups. On Saturday, the leaders of China and Taiwan will meet for the first time in over six decades. The surprise summit is best understood as a “Hail Mary” pass for both the Chinese Communist Party and Taiwan’s Kuomintang, or Nationalist Party. For Beijing, Taiwan’s upcoming elections threaten to mark the failure of China’s strategy for unifying the island with the mainland, as pursued by Hu Jintao and, now, Xi Jinping. China has never been cagey about its intentions: growing people-to-people and especially economic ties across the Taiwan Strait would lead, inevitably, to political integration of one kind or another. But deeper cross-Strait ties have not brought unification any closer. If anything, such ties have highlighted the vast differences between Taiwan and China; support for unification, already modest, has continued to shrink, while support for maintaining the status quo or pursuing eventual independence has grown. Indeed, growing domestic apprehensions regarding Taiwan President Ma Ying-jeou’s cross-Strait policies have, in part, put the independence-leaning Democratic Progressive Party in position to win the presidency and, possibly for the first time in Taiwan’s history, to take control of the legislature as well. Tsai Ying-wen, the DPP’s candidate for president, appears likely to run away with the election. It’s been an interesting week for those hoping that a landmark international agreement on climate change will come out of the UN conference in Paris later this year. On November 2 and 3, French President Francois Hollande was in Beijing, full of enthusiasm for the climate change promises China made during his two day visit. But a day after Hollande left China, the Chinese government released statistics revealing Beijing has severely underreported its coal consumption for the past decade. That, in turn, raised doubts that it can reach ambitious targets to cut coal use and reach peak emissions. The terrorists claiming they took down Metrojet Flight 9268 aren’t some run-of-the-mill jihadi crew but ‘one of the most active and potent ISIS affiliates,’ U.S. officials say. Soon after Russian planes began dropping bombs on Islamic militants in Syria a month ago, in an effort to prop up the country’s embattled dictator Bashar al-Assad, ISIS vowed that Russia, and by extension its citizens, would be a target. Last Saturday, Russian Metrojet Flight 9268 departed Sharm el-Sheikh, Egypt, and flew directly over the homebase of an ISIS affiliate with the ambition, and perhaps the capability, to make good on that threat. The growing fears that an explosive device may have brought down the airplane, killing all 224 on board, stems in part from the rise of the ISIS affiliate in the northern part of the Sinai peninsula. Over the past four years, the self-proclaimed Islamic State’s branch in Egypt’s Sinai peninsula has grown into a formidable threat. It “is one of the group’s most active and potent ISIL affiliates,” a U.S. counterterrorism official told The Daily Beast, using an alternative acronym for the group. Iran’s leaders may be pleased about their inclusion in the recent Vienna talks on Syria as a sign of newfound respect from the international community. The need for such talks in the first place was a reminder, though, of the precarious diplomatic and military position that Tehran still faces in the Levant. In the civil war’s fifth year, Iran recognizes it will likely never recoup a territorially intact, allied state and some partition is probably advantageous. There’s no question that Iran’s Islamic Revolutionary Guard Corps’ (IRGC) is increasing its numbers on the ground, remolding Syria’s security forces in its image, deploying Shia militias from around the region, and employing Lebanese Hezbollah in part to guarantee Tehran’s leverage in any political resolution. The difficulty is that Iran’s military advantage on the ground does not necessarily translate into the diplomatic strength needed for a favorable outcome. Russia’s intervention has probably staved off the collapse of Syrian President Bashar al Assad’s regime. Moscow’s joint operations aim only to secure a defendable remnant state in eastern Syria and gain leverage in any diplomatic settlement. As I have argued before, Iran’s objectives are broader than Russia’s. Moscow is not terribly interested in helping Tehran spread its political and religious influence in the Levant or strengthen its position against Israel. The Islamic State - Where is it now? Since the self-proclaimed Islamic State captured territory in Iraq and Syria in the summer of 2014, their network of affiliated groups has grown significantly. The Islamic State—known previously as al-Qaeda in Iraq—was disavowed from al-Qaeda in 2014 for its divergent philosophy and brutal tactics. Pre-existing terrorist groups in the Middle East, Africa, and elsewhere have declared their allegiance to the Islamic State, increasing the number of fighters to anywhere from twenty thousand to two hundred thousand in Iraq and Syria alone. Now, nearly thirty-five terrorist groups have declared their allegiance to the Islamic State and its leader, Abu Bakr al-Baghdadi. The Islamic State’s affiliates have been deemed “provinces”, and their locations range from West Africa to Pakistan. Affiliates in three countries in particular—Libya, Egypt, and Nigeria—chose the Islamic State over al-Qaeda. Now, the United States has to consider how to effectively “degrade and ultimately destroy” an entire network with a more effective recruiting campaign, particularly targeting potential “lone wolf” terrorists, rather than just core-Islamic State. So outside of Iraq and Syria, what is the United States really up against? Here’s an overview of the three biggest “provinces” of the Islamic State. THE HAGUE — Chemical weapons experts have determined that mustard gas was used in a Syrian town where Islamic State insurgents were battling another rebel group, according to a report by an international watchdog seen by Reuters. A confidential Oct. 29 report by the Organisation for the Prohibition of Chemical Weapons (OPCW), a summary of which was shown to Reuters, concluded “with the utmost confidence that at least two people were exposed to sulphur mustard” in the town of Marea, north of Aleppo, on Aug. 21. “It is very likely that the effects of sulphur mustard resulted in the death of a baby,” it said. The findings provide the first official confirmation of use of sulphur mustard, commonly known as mustard gas, in Syria since it agreed to destroy its chemical weapons stockpile, which included sulphur mustard. The report did not mention Islamic State, as the fact-finding mission was not mandated to assign blame, but diplomatic sources said the chemical had been used in the clashes between Islamic State and another rebel group taking place in the town at the time. David Cameron's decision to cancel British flights to the Egyptian desert resort of Sharm el-Sheikh is not exactly the welcome President Abdel Fattah el-Sisi was expecting when he flew to London for talks at Downing Street to rebuild Anglo-Egyptian relations after all the tumult of the past four years. "With neighbouring Libya now reduced to lawlessness, it is vital to Britain’s interests to have a strong and stable government in Egypt"
When I met Mr Sisi at the presidential palace in Cairo for an interview earlier this week, Mr Sisi dismissed claims that the Russian aircraft that crashed in Sinai on Sunday was the victim of a terrorist attack, claiming these suggestions were nothing more than “propaganda”. But that is clearly not how the British intelligence and security establishment view the incident, with the result that, following a Cobra meeting late on Wednesday, Mr Cameron made the decision to ground all British flights to and from Sinai. The U.S. State Department approved an $11.25-billion sale last month of four Lockheed Martin “Multi-Mission Surface Combatants,” or MMSCs, for the Royal Saudi Navy. While the announcement is only for a “possible” purchase, the deal is likely to move forward given Saudi Arabia’s need to update its aging Persian Gulf fleet. The sale comes as the region faces growing uncertainty as result of the Iran nuclear deal and a decreasing American naval presence. These ships will be equipped to meet these challenges – but not the growing threat of Iran’s ballistic missiles. The MMSCs are fast frigate-sized warships based on Lockheed’s Freedom-class littoral combat ship (LCS), currently in service with the U.S. Navy (USN). But unlike the troubled LCS concept – which has received criticism for being too lightly armed to survive a high-end conflict – the MMSCs will be better armed to combat a variety of high- and low-end threats. The Saudi ships will even feature greater air-defense capability than the USN’s replacement for the LCS. While the world is focused on Iran and nuclear proliferation in the Middle East, an accelerated round of nuclear plutonium production is about to get started in East Asia. Areva, the French nuclear export firm, is desperate for business, and therefore is seeking to sell a large plutonium separation plant to China. It is simultaneously urging Japan to start commercial operation of its large plutonium recycling complex, despite the unfavorable impact this would have on efforts to rein in worldwide production of nuclear explosives. Much has been written about changes to the Russian military's equipment and training, its concept of operations and, finally, its force projection -- in Crimea, Eastern Ukraine, and now in Syria. The changes herald major shifts in one of the world's largest militaries -- a force that has been eager to recapture the stature and momentum Moscow once held during the Cold War, where it rivaled United States across the globe. Underpinning such changes are numerous developments and policies taking place behind the scenes across Russia. The official newspaper of the Russian Armed Forces, Krasnaya Zvezda, (RedStar.ru) recently wrote about technological innovations that could result in significant changes to the way Russian military trains, fights and defends itself. On Oct. 5 and 6, an international exhibition titled "Innovation Day of the Armed Forces of the Russian Federation 2015" took place in several cities across Russia -- in Moscow, Ekaterinburg, Rostov-on-Don, and Vladivostok. According to RedStar, more than 30 conferences and roundtable discussion took place with the participation of representatives of enterprises from Russia and foreign countries. Participants discussed a wide range of issues, from innovation policies and ways to organize the logistics of the Armed Forces, to the prospects for use of the latest technological achievements in the interests of the military. After a week of meetings in Israel, one thing is clear to me: Israel has no Iran strategy. Seemingly spent from the losing public campaign against the Iranian nuclear deal, not even the passage of “Adoption Day” on October 18 roused Israeli officials from their post-deal slumber. Israelis reluctantly see themselves as bystanders to their fate—a position reinforced by Russia’s intervention in Syria—relegated to pleading with an Obama administration that is still crowing from its resolute achievement. Focused on abating the recent wave of Palestinian terrorism, Israel seems listless in the post–Iran deal era. The U.S. Navy is struggling to meet its worldwide commitments with only ten aircraft carriers in the fleet. The service has been down to ten flattops ever since USS Enterprise (CVN-65) was retired in December 2012. The Navy will only return to eleven ships once USS Gerald R. Ford is commissioned in 2016, but that vessel won’t be ready for deployment until 2021. But the law requires the Navy to operate a minimum of eleven carriers. The service is operating under a temporary exemption that allows it operate only ten vessels. But because the Navy is struggling to meet requirements with the current number of operational carriers, Congressman Mike Conaway (R-Texas) has introduced legislation to that would require the service to maintain a fleet of no less than twelve carriers. The law used to require the Navy to operate twelve flattops until the last conventionally U.S. carrier USS Kitty Hawk (CV-63) was retired in 2009. If Conaway’s bill—which was introduced on July 21, just before the summer recess—eventually becomes law, the Navy would be required to maintain twelve carriers once the new USS John F. Kennedy(CVN-79) is commissioned in 2023. MOSCOW — Russia has sent anti-aircraft missiles to Syria in order to safeguard its jets involved in airstrikes against militants in the war-battered Arab country, the commander of the Russian Air Force was quoted as saying Thursday. Russia has been carrying out airstrikes on Islamic State fighters in Syria since the end of September at the request of President Bashar Assad, Russia’s long-term ally. America's Worst Nightmare in Syria: Has Russia Deployed the Lethal S-300? Moscow may have deployed the powerful S-300 surface-to-air missile system to Syria according to some media reports. However, the reports are unconfirmed—Russian military officials have not specified what kind of missiles they are deploying—or if indeed they are adding to their forces in the region. “We have studied all the possible threats. We sent there not only fighter jets, attack aircraft, bomber aircraft, helicopters but also missile systems. As various force majeure circumstances may occur,” said Russian air force chief Col. Gen. Viktor Bondarev in an interview with the Komsomolskaya Pravda newspaper published on Thursday according to TASS. It’s not clear if Bondarev is referring to additional weapons or the handful of Pantsir-S1 point defense missiles Russia has already deployed to Syria. If the Russian military has deployed a version of the Almaz-Antey S-300 series, it would massively complicate air operations for U.S. and allied forces. Almaz-Antey currently builds two versions of the weapon system according to its product catalogue—the S-300PMU2 and the S-300VM, also referred to as the Antey-2500. Both have a range of more than 120 miles and can hit targets as high as 100,000ft. The weapons can engage half-a-dozen or more target simultaneously. The contractor, John C. Kingsley, said in court documents filed in the case that he discovered the Russians’ role after he was appointed to run one of the firms in 2010. He said the software they wrote had made it possible for the Pentagon’s communications systems to be infected with viruses. “On at least one occasion, numerous viruses were loaded onto the DISA [Defense Information Systems Agency] network as a result of code written by the Russian programmers and installed on servers in the DISA secure system,” Kingsley said in his complaint, filed under the federal False Claims Act in U.S. District Court in Washington, D.C., on March 18, 2011. Moscow's military force in Syria has grown to about 4,000 personnel, but this and more than a month of Russian air strikes have not led to pro-government forces making significant territorial gains, U.S. security officials and independent experts said. Moscow, which has maintained a military presence in Syria for decades as an ally of the ruling Assad family, had an estimated 2,000 personnel in the country when it began air strikes on Sept. 30. The Russian force has since roughly doubled and the number of bases it is using has grown, U.S. security officials said. The Russians have suffered combat casualties, including deaths, said three U.S. security officials familiar with U.S. intelligence reporting, adding that they did not know the exact numbers. The United States has extensive intelligence assets in the region, along with satellite imagery and electronic eavesdropping coverage and contacts with moderate Sunni and Kurdish rebels on the ground in Syria. President Obama may veto the annual defenseauthorization bill for the second time in his administration over its strictures on his push to close the U.S. military prison in Guantanamo Bay, Cuba, the White House warned Wednesday. Nigeria’s President Muhammadu Buhari is calling for civilian “foot soldiers” in the fight against Boko Haram, appealing to traditional hierarchies and centuries-old methods to weed out Islamist plotters. Eyes and ears on the ground were vital, he said, as concern mounts over suicide and bomb attacks in the northeast, particularly in mosques. “The ward head, the village head and the local police knew every new entrant into the community,” Buhari said late last month. Buhari has ordered his military commanders to end the violence by the end of the year, after at least 17,000 deaths and more than 2.5 million made homeless in six years of conflict. The NSA, which spies on electronic communications worldwide, is weeks away from ending its former indiscriminate vacuuming of information about Americans’ phone calls, or metadata, and replacing it with a more targeted system. Burr made his comments as lawmakers and Obama administration officials continue to disagree about the new approach to call monitoring, set to take effect on Nov. 29 under a law that overhauled domestic surveillance practices. It will replace a system exposed publicly more than two years ago by former NSA contractor Edward Snowden and denounced by civil liberties advocates as overly intrusive. The new system cannot be relied upon for national security purposes, Burr said in an interview on Tuesday. The legendary Sahara covers a vast stretch of northern Africa, and includes a 100,000-mile expanse that is the southern half of my homeland, the Kingdom of Morocco. Regrettably, this stretch of land is also home to one of the longest enduring, and perhaps the most uselessly destructive, conflicts on the continent. Forty years ago this week, 330,000 of my fellow citizens reclaimed the Moroccan Sahara from its Spanish occupiers, firmly but peacefully, in what has become known as the “Green March”: the only movement of national resistance against European imperialism to be waged successfully without a drop of blood. Alas, fascist Spain had already managed to sow the seeds of violence in the territory before its withdrawal. In the latter years of its imperialist adventure, the Spanish government created a separatist movement of indigenous collaborators, the “Polisario,” to lay claim to every inch of the Moroccan Sahara. In 1975, the group initially eschewed any attempt to counter the “Green March.” But the military government in Algiers subsequently began to fund, train and arm a generation of Polisario fighters—aligned at the time with the Soviet Union and seeking to bleed pro-American Morocco, it found in the group a willing proxy. Polisario guerrillas fought a devastating 15-year war with Morocco, enabling oil- and gas-rich Algeria to weaken the oil-poor kingdom at little cost to itself. The Senate Has Delayed Confirming an Ambassador to Mexico. America Needs One Now. The U.S. Embassy in Mexico City has been without an ambassador since July. It's not all that unusual for an embassy to be vacant for a few months, but then again, this is not a usual relationship. Not only is this one of the largest U.S. embassies in the world, but it is the hub for managing one of our country's most complex and important relationships, and one that has tangible value for millions of Americans in their daily life. To begin with, Mexico and the United States trade over a half-trillion dollars’ worth of goods and services a year, or more than a million dollars a minute, only slightly behind Canada and China as America's third-largest commercial relationship. What’s more, Mexico is the United States’ second-biggest export market, ahead of China, and people in twenty-seven states—from Texas and Arizona to Nebraska, Iowa, Michigan, and even New Hampshire—depend on Mexico as the first or second destination for exports produced in their state. Around six million U.S. jobs are closely tied to exports to Mexico. Since the United States sailed in the waters close to Subi Reef, a low-tide election (LTE) that China has built up into a massive artificial island, someexperts have charged that the U.S. bungled the operation by conducting an “innocent passage,” implicitly granting China a 12 nautical mile territorial sea around the LTE to which it is not entitled. This accusation is not valid, however, and reflects an incomplete understanding of what is admittedly a complicated element of the Law of the Sea Convention. Critics of the naval maneuver have contended that to underscore the message to China that it is not entitled to a territorial sea around Subi Reef it was necessary to conduct a freedom of navigation operation in a manner that blatantly challenges an excessive maritime claim that goes beyond what is entitled under the United Nations Convention on the Law of the Sea (UNCLOS). In other words … no innocent passage. However, the geography of the Spratly archipelago, which contains more than 120 scattered islands, isles, shoals, banks, atolls, cays and reefs situated in close proximity to one another is key to understanding the nature of the U.S. Navy’s freedom of navigation operation. Before analyzing this criticism, the relationship between maritime geography and the law of the sea must also be set out. Iran’s powerful Revolutionary Guard military force hacked email and social-media accounts of Obama administration officials in recent weeks in attacks believed to be tied to the arrest in Tehran of an Iranian-American businessman, U.S. officials said. The Islamic Revolutionary Guard Corps, or IRGC, has routinely conducted cyberwarfare against American government agencies for years. But the U.S. officials said there has been a surge in such attacks coinciding with the arrest last month of Siamak Namazi, an energy industry executive and business consultant who has pushed for stronger U.S.-Iranian economic and diplomatic ties. Obama administration personnel are among a larger group of people who have had their computer systems hacked in recent weeks, including journalists and academics, the officials said. Those attacked in the administration included officials working at the State Department’s Office of Iranian Affairs and its Bureau of Near Eastern Affairs. “U.S. officials were among many who were targeted by recent cyberattacks,” said an administration official, adding that the U.S. is still investigating possible links to the Namazi case. “U.S. officials believe some of the more recent attacks may be linked to reports of detained dual citizens and others.”Friends and business associates of Mr. Namazi said the intelligence arm of the IRGC confiscated his computer after ransacking his family’s home in Tehran. A well-crystallized debate rages on across the member states of the European Union. On one side are those such as European Commission President Jean-Claude Juncker who push for further integration as the palliative to the many ills of a still-incomplete union. To wit, in Juncker's State of the Union speech: "There is not enough Europe in this Union. And there is not enough Union in this Union." "Enlargement affected Europe's ability to respond to the shocks of subsequent years in two ways. First, it forced the EU to take its eye off the ball at a critical time when it should have focused on building the institutions needed to make the euro work. Second, enlargement meant that EU countries that were not in the eurozone suddenly found themselves in the majority. That shift naturally shaped the EU's own agenda. I recall the obsession during those years with competitiveness, a typical small-country economic issue. Debates on the reform of Europe's treaties during those years focused on voting rights and the protection of minorities. It was the overwhelming view of European officials and members of the European Parliament that the eurozone itself did not need to be fixed." The Pentagon agency that oversees contracts says it can’t rely on cost and schedule projections from General Dynamics Corp.’s warship unit in a $22 billion program to build three Zumwalt-class destroyers. The Defense Contract Management Agency wrote in an assessment that it “has no confidence in” the data because the unit, Bath Iron Works, hasn’t shown that it’s remedied 56 serious deficiencies the agency first cited in 2011. The flaws were in the shipbuilder’s “earned value management system,” which tracks how effectively milestones for the destroyers are being met. The finding of “no confidence” means the agency considers data produced by Bath Iron Works “unreliable and inaccurate,” agency spokesman Mark Woodbury said in an e-mail. The agency “identified systemic deficiencies in scheduling processes” and “estimates of cost at completion that were not being updated based upon performance trends” with the vessels, he said. While Woodbury says the contracting agency hasn’t been given documentation that the flaws it cited have been remedied, the company and the Navy say most of the issues have been resolved. The .50 caliber M2 machine gun was designed in 1918, near the end of World War I by John Browning. Production began in 1921 and the weapon was designed so a single receiver could be turned into seven different variants by adding jackets, barrels or other components. The recent New York Times article about the concerns that Russia might be prepared to cut the submarine cables carrying voice and data traffic between North America and Europe conveys the impression that this is new territory for the United States. It is, in fact, not, and as an earlier War on the Rocks article noted, it was something that the United States experienced at the hands of the Germans during World War I. But the United States has itself cut cables in wartime as a means of disrupting the ability of an enemy power to command and control its distant forces. It conducted these operations during the short Spanish-American war of 1898. These actions reflected careful and innovative thinking by naval officers about the strategic significance of a technology central to the global economy of the day.